With a semi polished blade of 4" long, it is very strong. Rosewood handle over a full tang with 2 rivets. It also has a lanyard hole. It also has a hand/finget guard bolster for protection. 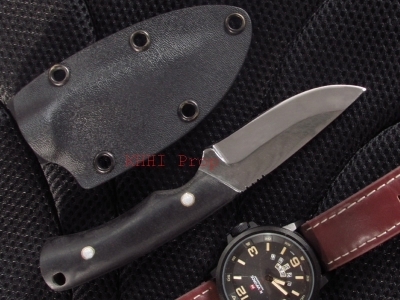 The sheath is made from 'Cordura' which is a strong and sturdy material. 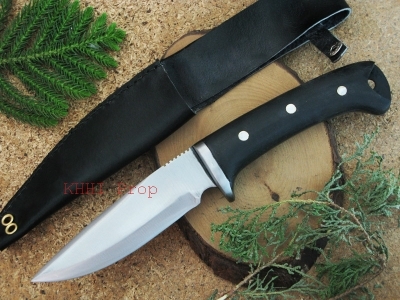 Introducing yet another outstanding small knife to boost the vast collection of KHHI. Simple yet style of its own, small and strong, light yet heavy, compactly and creatively built for the best and maximum result. 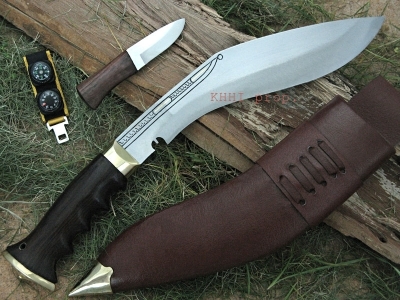 KHHI comes with simple and strong kukri keeping in mind its uses for trekkers, travelers, explorers, hunters, and wilderness lovers. 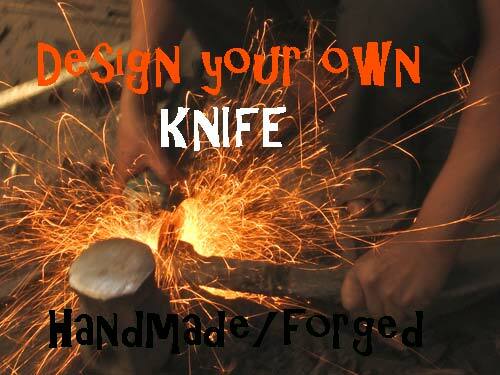 Outdoor Utility Knife is a simple yet unique knife released with features of light weight, easy handling, and protective hand guard. It serves as a perfect utility knife. 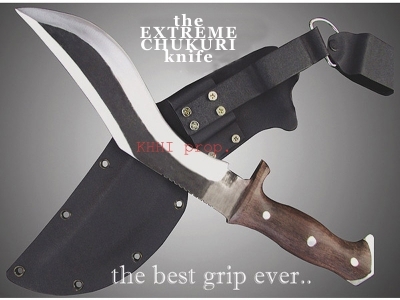 Blade: The blade of this 4inch long khukri is made from SUVs suspension steel for stronger blade, it is semi-polished, simple and easy to maintain knife. 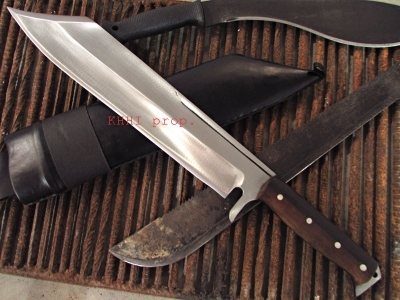 Handle: The handle is like of the panawal version of kukris where wooden pieces are glued to the full flat tang with epoxy and further riveted for strength. At the top of the handle, you can find a guard replacing a normal bolster. 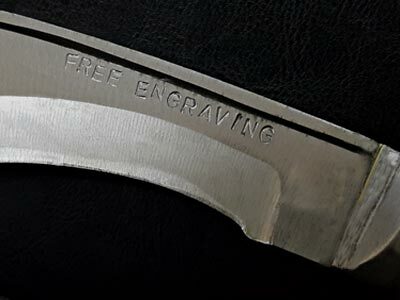 This protects the hand from slipping into the blade and prevents cuts. 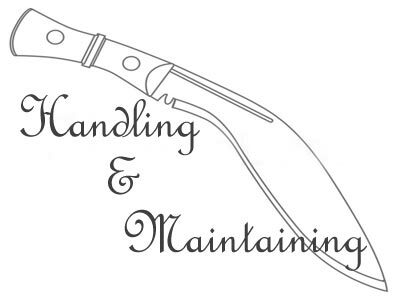 While the bottom of the handle features a lanyard hole where string can go through and prevents dropping of knife away from the hand. 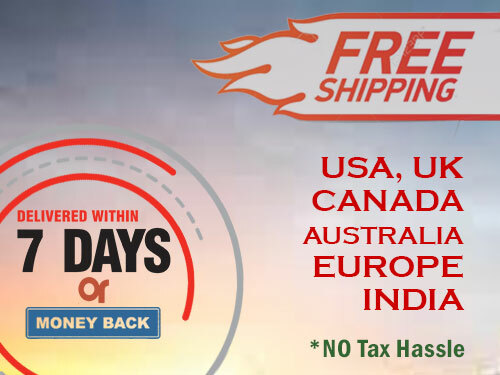 The overall body is shaped ergonomically to fit in user’s hand perfectly providing confident grip and easy usability. 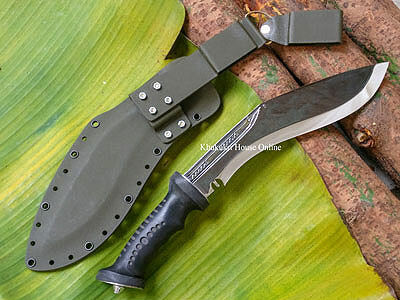 Scabbard: The scabbard for this knife is made with a hard and sturdy material called “Cordura” making it durable and strong. Further, it is easier to maintain because of its easy to clean and waterproof texture. 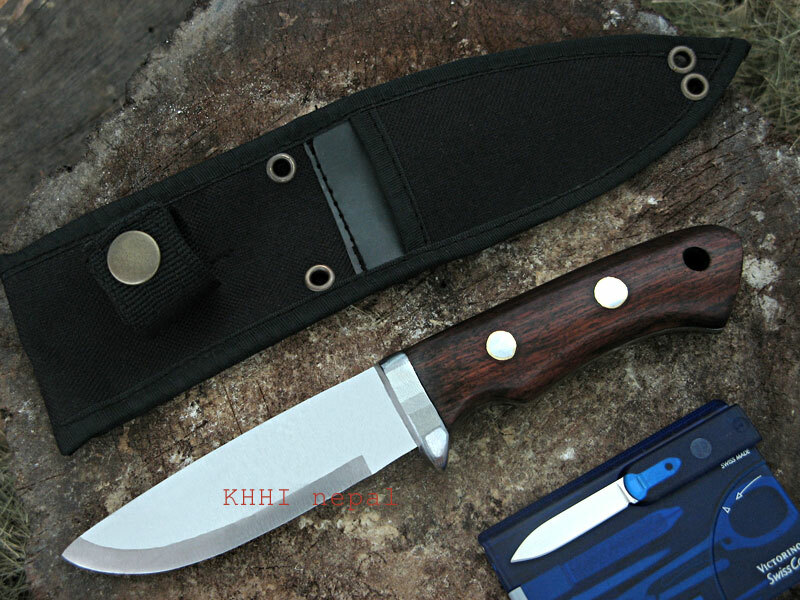 It is featured with a buttoned belt to hold the knife and provides a strict in/out action of the knife.